1. Marinate the cucumber pieces in salt for 15 minutes. 2. Ensure the cucumbers are evenly coated. 4. Combine all the dressing ingredients and mix well. 5. Transfer the cucumbers to a serving bowl. 6. Add the garlic, red chillies and pour the dressing on top. 7. Stir to mix well. 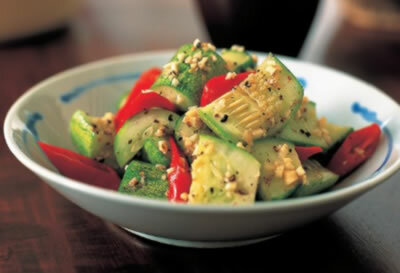 Feel free to comment or share your thoughts on this Cucumber Salad with Sesame Dressing Recipe from Awesome Cuisine.